The First Vino Mas Theme Night! It's a LUAU. Think sun and warmth! Dress in your favorite Hawaiian gear. This will be a "pot luck" night. The entry to the event will be the purchase of a bottle of wine from Vino Mas to share with the group. 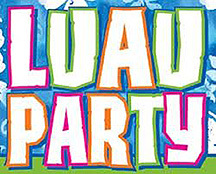 Bring a dish to share, it can be luau themed if you want it to, but does not have to be. Festivities will start at 6pm.